The classic prawn noodle is a popular hawker dish that may seem simple to put together but truly, it requires much more than just prawns, water and noodles. It is through a cook’s manipulation of skill, time and ingredients that give you that comforting, flavourful bowl of broth. Filled with yellow noodles, juicy prawns and bean sprouts that sit in said flavourful broth, this dish is simply perfect to be had for breakfast, lunch, dinner or supper. The key to an outstanding bowl of prawn noodles lies in its soup and we have tried several versions over the years that either disappointed us or left us wanting more. Here at Da Dong Prawn Noodle, their soup is much lighter in comparison but it does pack one heck of an umami kick. 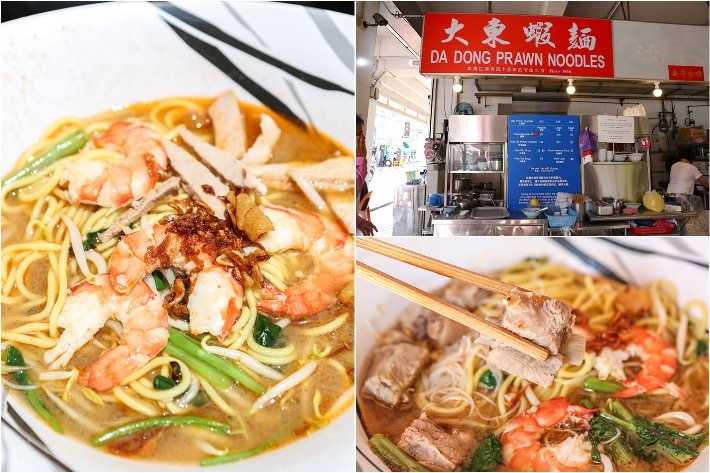 Known to be one of the best prawn noodles in Singapore, Da Dong Prawn Noodles keeps their loyal customers going back for more with their sweet and savoury, orange-hued broth. Here’s what we think. We got ourselves 2 bowls of their regular-sized classic Prawn Noodle (S$8). We ordered just the yellow noodles and it came with few pieces of juicy prawns, kang kong, thin slices of pork meat and bean sprouts. Although it was not as rich and full-bodied as we expected it to be, the soup was savoury with a mild but lasting aftertaste. Next came the Pork Rib Prawn Noodles (S$8), which contained pork ribs and pig’s tail. The pork ribs absorbed all the flavours of the broth and they were really tender and literally falling off the bone. We liked that they also added crispy fried pork lard on top, which added a nice crunchy texture to it. Although Da Dong Prawn Noodle might be a little bit pricier than others, we have to admit it is one of the better prawn noodles that we have tried and the light broth is strangely addictive. But as to whether it is the best out there, we can’t help but disagree. Do note that they do not allow refills so be sure to slurp down to the very last drop!